In Medieval Europe, several countries banned crossbows and arbalests for civilian use. The reason was transparent: protecting the monopoly of armored knights and soldiers on effective violence. Crossbows were far easier to learn than longbows and quite effective against armor at close to medium range. In our days, crossbows are still banned in quite a few places. American government hasn’t banned the modern equivalent of the crossbow, the rifle, yet. But they did quietly ban bullets that are relatively effective against armor last year. Used primarily for dangerous game hunting, lathed brass bullets are no longer legal for civilian ownership. Even the hollow point bullets designed for controlled expansion such as shown above are considered AP based on the alloy used. You can see the result of having only low-penetration ammunition available: most American rifles won’t defeat cover effectively. They can still penetrate soft vests but not even the wimpiest of the hard plates. In the video, the only good penetrator ends up being imported 5.45×39, mainly thanks to the relatively thick jacket. But .308 bullets available today are much less effective against cover, vehicles and armor than WW2 vintage 30-06 AP ammunition was. In combat, that puts American civilians at an added disadvantage relative to the various enforcement agencies who have armor and aren’t so handicapped in the choice of munitions. This entry was posted in ammunition, rifle, rkba, self-defense, weapon. Bookmark the permalink. I was under the impression that the definition for “armor piercing” applied only to handgun ammunition, and that essentially anything goes as far rifle ammo is concerned. Originally, that was so. The definition was applied to rifle bullets last year. If I recall correctly, I think the confusion comes from a couple of raids the ATF did on one or two small time bullet manufacturers, where the ATF used AR pistols as their excuse to invoke the law on “armor piercing” ammo. Since then I haven’t seen any further indications this has been applied more widely. Ammo manufacturers are telling me that they have not been able to make new bullets. Ammo manufacturers aren’t an authoritative source of gun law. They certainly haven’t gone after Barnes, and I see plenty of other monolithic copper bullets available. Well at least as available as anything is these days :-). 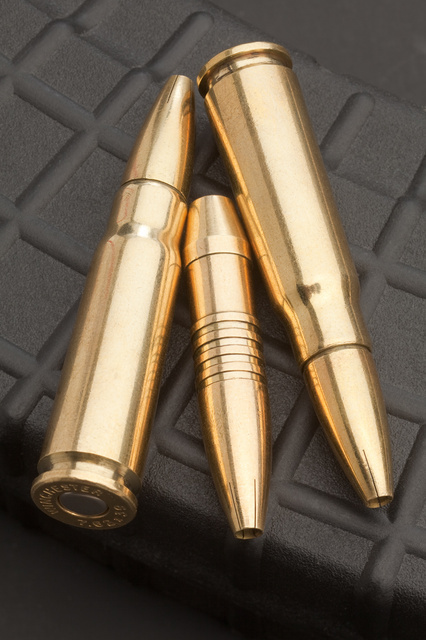 Hornady’s solid bullets are Gilding Metal, not copper, and thus are technically Brass. I assume they are not a very hard alloy. Can you cite the relevant statute? I see nothing in the United States Code banning “rifle bullets”. ATF ruling, not law. My info comes from two unrelated ammo companies. Those lathed brass bullets are beautiful! I need some of those for my desk. No longer legal for you to have as of last year. Guess we’ll need to practice head shots. Mild steel ammo doesn’t penetrate that well, I suppose. What’s the use anyway? Even 7.62×54 in military AP loadings didn’t work well in Iraq, so it’s not like any other ammo short of .338 or .50 or such rarities would work flawlessly..
All available material on US laws shows that armor piercing restrictions only apply to bullets that can be used in handguns. There aren’t any judicial opinions that I’ve been able to find that counteract that, nor are there any court cases I’ve been able to find regarding armor piercing rifle rounds being illegal. If you say something is illegal, you have to have more than the word of two manufacturers to back it up. Any single court case that hinged on rifle ammunition that was deemed to be illegal due to the armor piercing nature of the rounds would be ideal. If that’s so.. can’t the ATF place an order for contender pistols in all rifle calibers and be done with it.. ? Letter of the law and all that..
That’s not even broaching Barnes, who make a plethora of monolithic copper bullets. The ballistics of the lighter brass or copper bullets require some extra attention on the loading bench. They’re larger for their grain weight, and often intrude into the case, eating up valuable powder space. I’ve got some copper round stock and a lathe, and considered my own. I just need to design it, and I’d much prefer a lathe-turned projectile with a lead or steel core inserted to bring the throw weight back up to something more useful. Why am I getting ammo makers tell me that they can’t even hand me a single dummy round for photos in calibers known not to be pistol-compatible? I think it’s because the only way to have power in a notionally free society is to criminalize everything and enforce the laws arbitrarily.. Hence they’re uncertain and don’t want to risk trouble, especially if they know the bullets would end up photographed by someone who has a reasonably high public profile and is known to dislike ATF .. I have never seen anything even remotely like sufficient evidence to support the claim the crossbows were banned for civilian ownership during the Middle Ages. Innocent II’s declaration had to do with warfare, and as you can see, it wasn’t very effective. For some reason your comment stuck with me. I found tretise from an English (well, British at least) source, does it qualify? Of note is 1540 and again in 1541 when Henry VIII banned crossbows in England (in favor of longbows). Admittedly this is considered more the Renaissance than Medieval period, but close enough from this end of history? The 16th century is definitively in the post-Medieval period. Besides, while the exact wording of the 1509 law leaves things a bit unclear to modern ears, what seems fairly evident to me is the intent: Henry liked longbows better, and wanted them to be the prevent arm in Britain. A far cry from disarmament! This would be the equivalent of a modern monarch banning AKs, because he liked AR-15s better and thought people should own those, instead.